You may have heard of a new diet based on controlling the acid/base balance of the body to achieve a better state of health. The “Alkaline Diet” is gaining popularity claiming that the American diet is too acidic. Because human blood pH should be slightly alkaline (7.35 - 7.45), the body will try to compensate for an acidic pH by using alkaline minerals. If the diet does not contain enough minerals (from alkaline foods) to compensate, a buildup of acids in the cells will cause disease. Proponents of the diet claim that foods rich in alkaline minerals such as calcium, magnesium, and potassium offset the acidifying effect of high acid foods- namely meat and dairy products. According to the diet, alkaline foods should make up 60% of the diet, and acid foods only 40%. 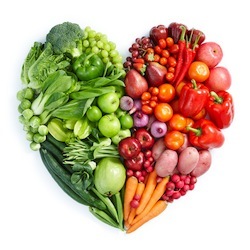 Alkaline foods are most fruits, green vegetables, peas, beans, lentils, spices, herbs and seasonings, and seeds and nuts, while acid forming foods include meat, fish, poultry, eggs, and grains. The evidence for the type of diet is not conclusive, although some studies have shown that eating too much protein can cause a buildup of ketones, a toxic substance that the liver creates when too much protein is consumed. This can cause the kidneys to become stressed, and because a large amount of water is required in the process it could also lead to dehydration. Another problem is seen when it comes to bone health. Protein is acid-producing and requires an alkaline substance to buffer or neutralize its acidity. This buffer comes from our calcium-rich bones, so when protein is consumed in high amounts, bone loss could be a result. These potential drawbacks are good reasons to stick to the recommended daily amount of protein, but certainly not reasons to avoid it. Pregnant women need 71 grams per day- so unless your diet includes less vegetables, grains and fruits than meat, there’s no need to worry that you’re getting too much. There are some health related conditions for which a low acid diet can be beneficial and one of them happens to be commonly encountered during the later stages of pregnancy. This condition is gastric reflux, and Dr. Jamie Koufman, author of the new book, “Dropping Acid: The Reflux Diet Cookbook & Cure,” advocates a low-acid diet to prevent it. Foods with higher acidity such as soda, strawberries, and barbeque sauce can all worsen the symptoms of acid reflux. She recommends eating fewer high acid foods and more alkaline ones- such as banana, broccoli, and oatmeal, to relieve heartburn and reflux symptoms. For the first few weeks of the diet the only fruits allowed are the lower acid fruits- melons and bananas. Most vegetables are allowed except tomatoes and onions. Whole grains and fish or skinless poultry are also recommended. Regardless of pH levels, high-fat meats, dairy products, caffeine, chocolate, carbonated beverages, fried foods, alcohol and mints are known to aggravate reflux symptoms. Certain other foods, including garlic, nuts, cucumbers and highly spiced dishes, may also make reflux worse in some patients. If gastric reflux is a problem for you, then using these strategies may be helpful; otherwise, eating less processed foods and filling half your plate with fruits and vegetables and the other half with lean protein and whole grains will promote health and balance- regardless of pH content.